Two highly related casein kinase I isoforms, e and 5, are components of the mammalian circadian oscillator. These two kinases are 97% homologous and have over 80% homol-ogy to DBT in the kinase domain; their C-terminal tails are unrelated to the corresponding region in DBT. CKIe and CKI5 bind mammalian PER1 and PER2 proteins in tissue culture and in vivo and also phosphorylate both PER proteins in vitro [15,16,17,18]. In cultured cells CKIe and CKI5 regulate nuclear entry and stability of the mammalian PER proteins. CKIe has been implicated in regulating the subcellular localization of PER1 by trapping otherwise nuclear PER1 protein in the cytoplasm in cultured human embryonic kidney cells, but translocating PER1 and PER3 to the nucleus in COS-7 cells [17,18]. Contradictory results from tissue-culture experiments may reflect cell-line-dependent variability in the expression of other factors required for CKI-regulated PER nuclear translocation. CKI also seems to regulate CLK/ BMAL-dependent transcription. Reduction of CKI activity inhibits transcriptional activation by CLK/BMAL [19,20]. Immunoprecipitations from mouse liver show both CKI isoforms interacting with PER1 and PER2 proteins, specifically with the phosphorylated forms of the PER proteins . In mice, the subcellular location of CKIe also varies with circadian time, as originally found in Drosophila. Figure 1 Regulatory activities of DBT/CKI within models of the Drosophila (A) and Mammalian (B) circadian clocks. PER is found in a complex with CKI throughout the circadian cycle. 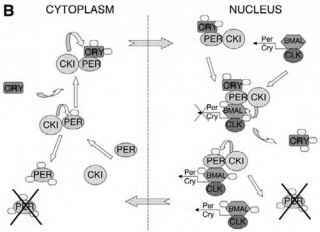 In the middle of the day cytoplasmic, newly synthesized PER interacts with CKI and is phosphorylated and degraded. 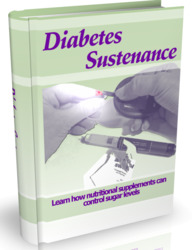 In the early evening, TIM in Drosophila and CRY in mammals, accumulate and associate with PER. Such complexes are no longer destabilized by CKI. 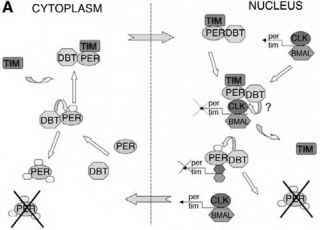 In Drosphila cells, PER bound to TIM and DBT translocates to the nucleus. In mammals, PER forms cytoplasmic complexes with CRY and CKI preceding nuclear translocation. CRY is phosphorylated in the latter complexes by CKI in a PER dependent manner. In the nucleus PER-containing complexes bind two transcription factors, CLK and BMAL. When expressed alone, CLK and BMAL activate per and tim (files) or Per and Cry (mammals) expression, but further association with PER-containing complexes suppresses this activity. These interations also suppress clock controlled genes that function downstream of the central oscillator. In the multiprotein complex CKI phosphorylated BMAL in mammalian cells, which increases its activity and may be required to overcome the repression in the end of the circadian cycle. In the early morning, at the peak of transcriptional inhibition in Drosophila, TIM is degraded and CKI phosphorylated PER. Hyperphosphorylated nuclear PER is ubiquiti-nated and degraded in the early morning allowing a new transcriptional cycle to start. The majority of the kinase is located in the cytoplasm but a fraction translocates to the nucleus during the night when PER proteins are expected to enter the nucleus . Nuclear localization of CKIe and 5 is dramatically reduced in cryptochrome 1 and 2 double-knockout mice where PER proteins show a strong reduction in nuclear translocation. In the nucleus, both kinases appear to be part of a larger protein complex that contains all known clock proteins . Genetic evidence for CKI involvement in the mammalian clock comes from the identification of two mutations that cause shortened behavioral rhythms in the Syrian golden hamster mutant tau and in humans with familial advanced sleep phase syndrome (FASPS). The tau mutation in the Syrian golden hamster leads to a fast-running circadian clock with a period of 20 hours . The mutation lies in the hamster homolog of CKIe. In vitro, this mutation leads to a decrease in kinase activity to about 15% of the wild-type level. In vivo, there is also a reduction in the abundance of CKIe to half the wild-type level . PER proteins are fully phosphorylated in the mutant hamster, indicating that CKI5 may compensate for reduced CKIe activity and suggesting a dominant-negative function for the tau mutant CKIe . FASPS in humans is an inherited, dominant circadian clock disorder that involves slightly reduced period length to 23 hours and a significant phase advance. Patients with FASPS typically awaken prematurely (~ 4:00 a.m.) and sleep onset is similarly advanced by 3 to 4 hours . The FASPS-causing mutation in one recently studied kindred lies in the human ortholog of the mouse per2 gene changing Ser 662 to Gly in a potential CKI phosphorylation site . 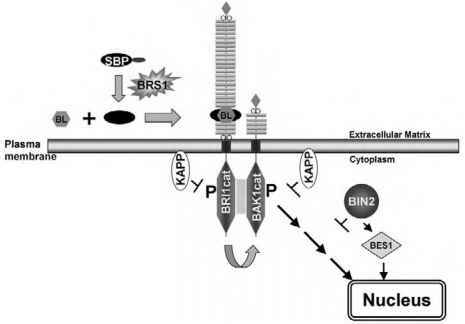 The mutant protein is phosphorylated in vitro with a reduced rate by CKIe . Sequences immediately downstream of the mutation contain several potential CKI phosphorylation sites that may be phosphorylated in a cascade starting from the first site. Human PER2 does indeed become progressively phosphorylated over time in an in vitro kinase assay supporting the idea of consecutive phosphorylation of these sites .